For whatever reason, Apple decided not to include a calculator app with the iPad. Luckily lots of been created by developers. Today we decided we wanted something a little different from all the basic calculators that are available. 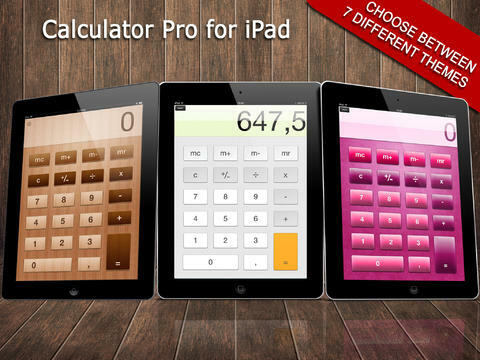 App-island Studios recently released Calculator Plus for iPad. Calculator Plus offers everything you need in a calculator and allows you to customize your experience by choosing between 7 different themes. No longer will you have to look at the same calculator over and over, you can simply change the theme at anytime and feel like you are using a completely different app. When you put the iPad in portrait mode you will get just your basic calculator functions. If you need to use some scientific functions just flip the iPad into landscape mode and you will have way more options to choose from including degrees and radians calculations. Calculator Plus for iPad is currently on sale for the low low price of FREE. If you need a calculator app that you can customize to your style you should hurry up and grab this one. It will do almost anything you need.